Brakes are a touring component that you shouldn’t compromise on. A smooth and powerful brake will give you enough confidence to enjoy steep downhills that may have otherwise given you goose bumps. This resource talks all things brakes, covering the strengths and weaknesses of the four different touring brake systems available. 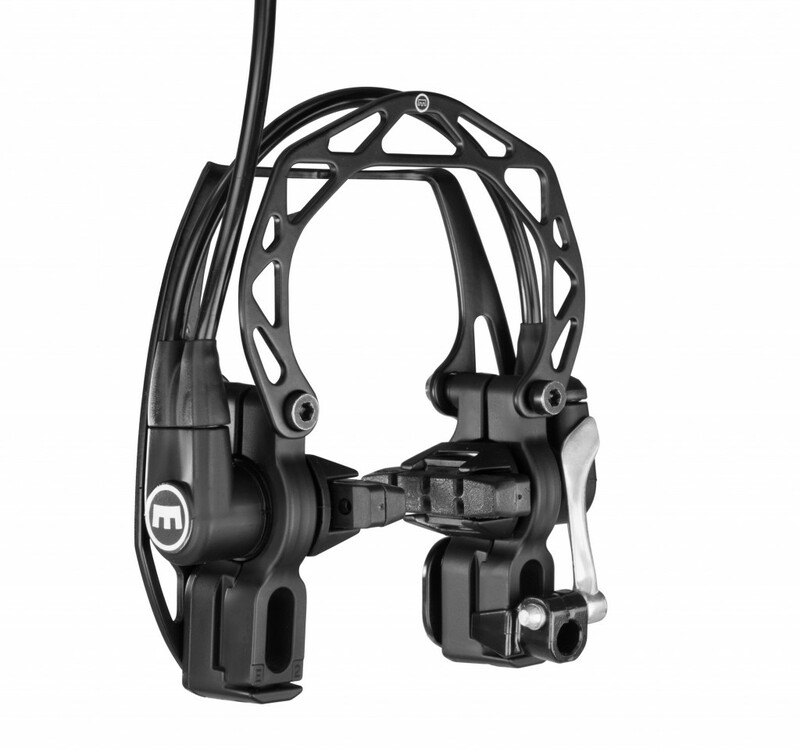 Down the bottom of this page is my ideal touring brake setup. 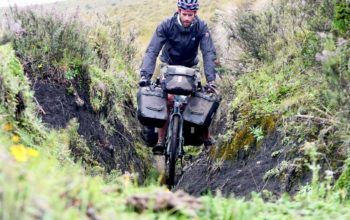 Reliability is key on a touring bike. Ideally you want your touring bike to be as resilient as possible to riding abuse, road/weather conditions and vandalism. Disc and rim brakes have their advantages and disadvantages here. Contamination. Disc brake pads can be affected by contamination, in fact once a disc brake pad is contaminated there is a chance it may never become good again. Contaminated rotors should be cleaned with alcohol to ensure that they do not contaminate the pads. Rotor damage. It is possible to warp disc rotors; even a slight warp can result in disc rub. I often take my rotors off when they’re susceptible to damage (flights), but have found that generally my front and rear racks do a really good job of protecting my rotors. Brake pad wear. 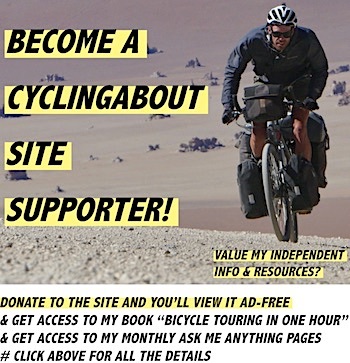 Round-the-world cyclists often get over 10000km on a set of metal sintered disc brake pads; I generally get over 5000km on my tandem. This is roughly twice as much life as you can expect from a set of rim brake pads. Pad wear depends on weather conditions, the size of the hills you ride, how clean you keep your bike and how well your bike is maintained. Always consider that your bike may not be treated the way you’d like it to… sometimes it’s wise to take off disc rotors. Rim wear. 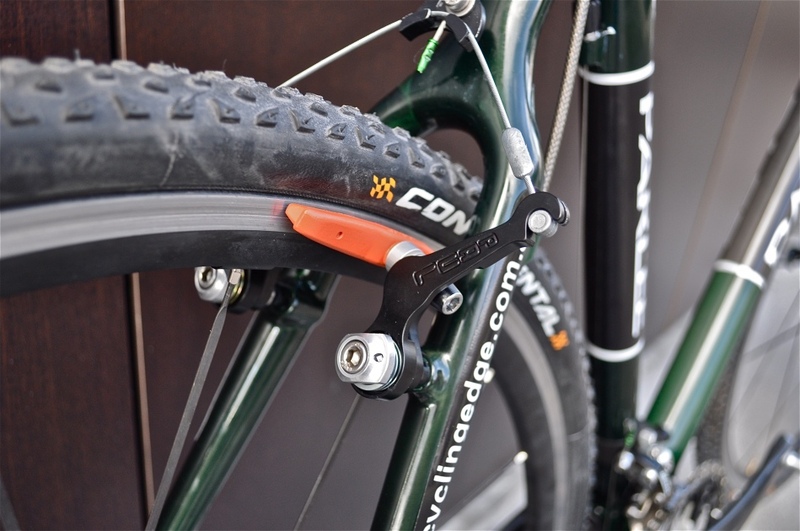 Cantilever, v-brakes and hydraulic rim brakes will wear out rim sidewalls over time, and even more so if you don’t clean your rims and your brake pads regularly. The most wear-resistant (and strongest) rims that I’ve found are made by Rigida (Andra 30 CSS and Grizzly CSS) which are coated with carbide and are meant to be almost impossible to wear out. Contamination. A rim brake surface is very exposed, allowing oils and grime from the road to easily get onto your rims. Once your brake pads get a bit of oil onto them they will definitely slip a bit. That said, I’ve never been so affected by contamination that I cannot slow down at all. It’s easy to clean your rims; you can either just give it a simple clean with water, or use alcohols such as methylated spirits to break down the oils on your rim. Brake pad wear. Rim brake pads often last about 5000km on a round-the-world touring bike. This is about half the distance of a set of disc brake pads in the same conditions. Damaged rims. 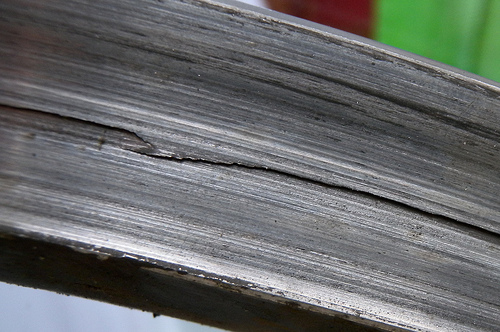 If you damage a rim on a bike that relies on a rim surface, this will impact on your ability to stop well. Unfortunately, rim brakes don’t work well with dinted and buckled wheels. Here’s an example of a rim well and truly worn out from brake pads. 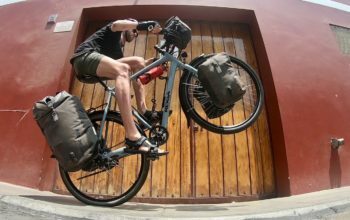 On a loaded touring bike you’ll sometimes need to stop a lot of weight, very quickly. This could be due to animals crossing the road, unexpected turns, cars driving out in front of you, large potholes or perhaps glass on the road. Random events will happen to you and will require the ability to stop quickly. 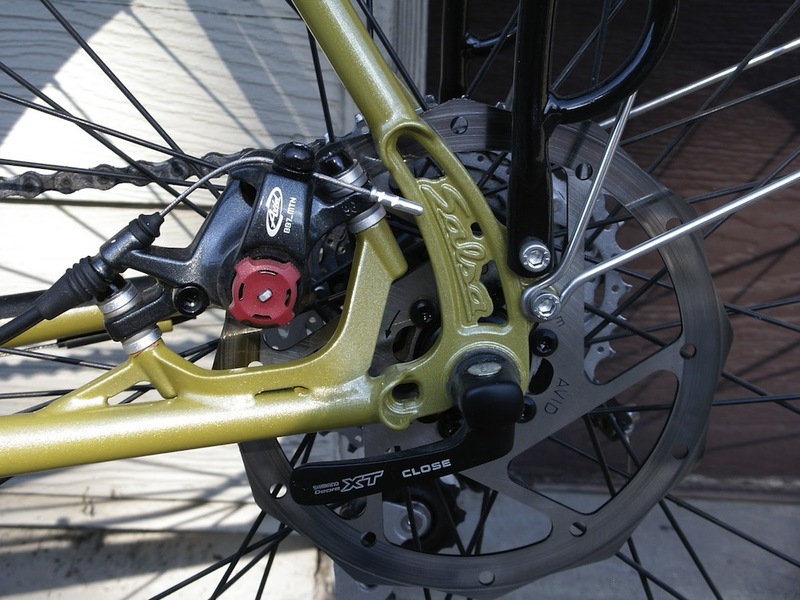 Disc brakes offer the best braking performance for touring bikes in both wet and dry conditions. Disc brakes really shine in adverse weather conditions as they’re unaffected by water and dirt. 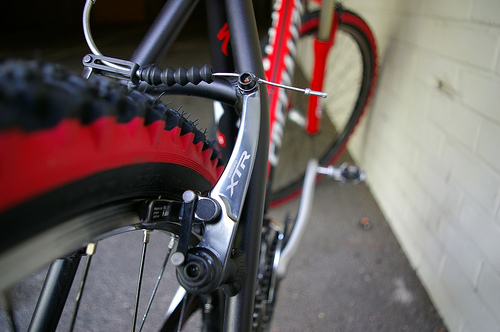 V-brakes can slow a loaded touring bike in dry conditions very well, as can hydraulic rim brakes. 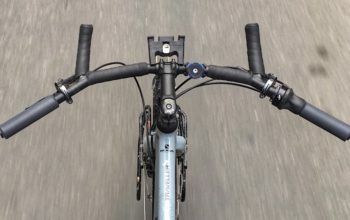 Cantilever brakes don’t quite stack up to the other rim brake options with regards to performance. This is because they use shorter brake arms with a lower leverage ratio. Spare brake parts are ideally available to you wherever you are, but this will not always be the case. The most common spares in countries around the world are rim pads, cables and replacement v-brake calipers. 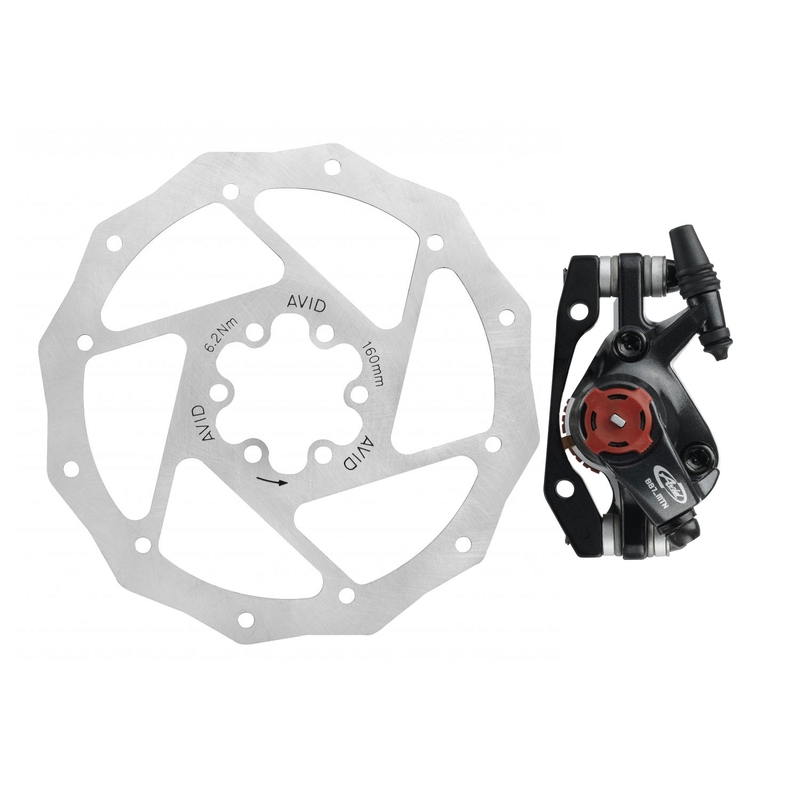 Disc brake pads, rotors and spare parts are often limited to larger cities only. 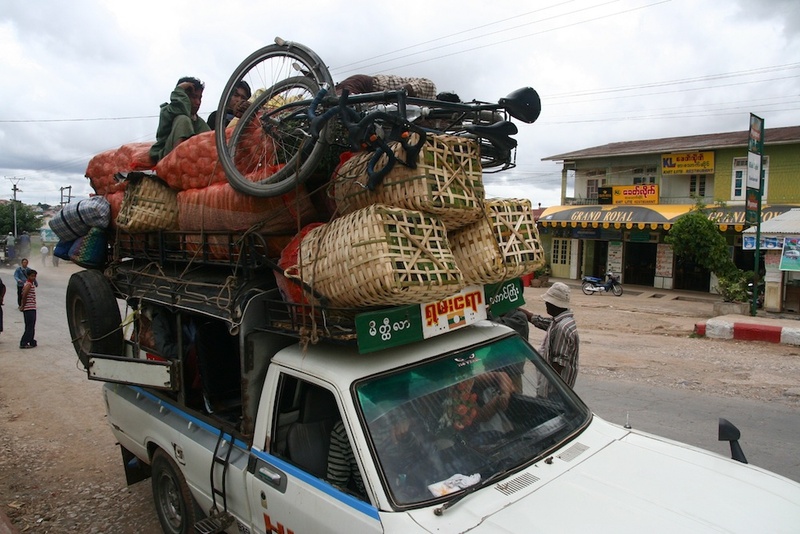 If you are riding a remote tour it’s best to carry as many spares as feasible. I generally recommend a few brake pads and some inner and outer cables. Firstly, check out the Cane Creek V-Levers. They’ll give you the right pull-ratio to match your v-brake calipers. 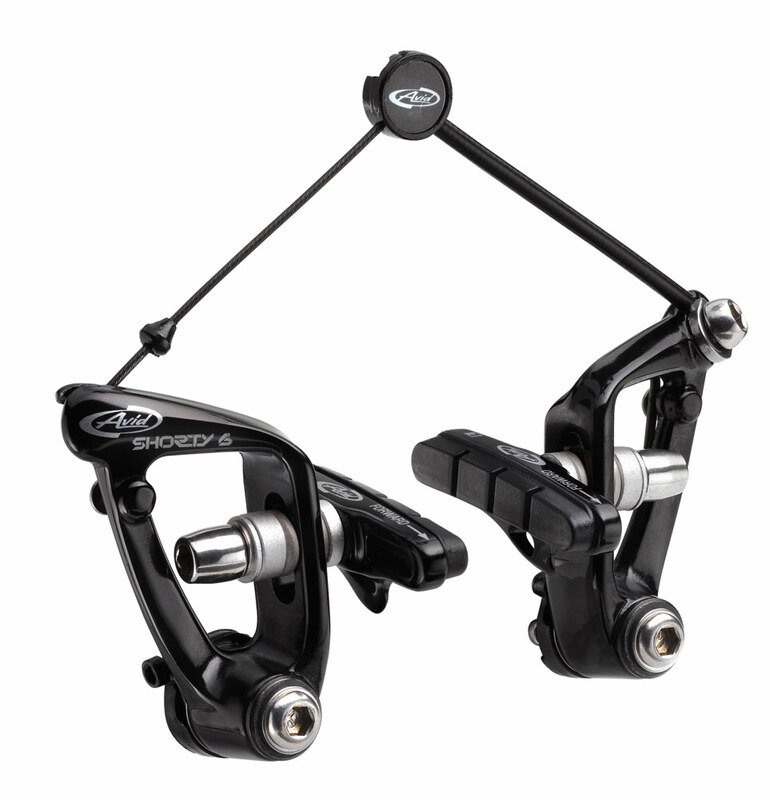 STI Road Shifters and V-Brakes – Option 1: ‘Mini’ v-brake calipers work directly with STI road shifters (ie. road bar compatible). The downside to these is that they offer less power than a standard v-brake, as well as decreased pad/rim clearance. They also don’t have the same tyre clearance as a standard v-brake. Check out the Tektro 926 or TRP CX9 if you do decide to go down this route. STI Road Shifters and V-Brakes – Option 2: Check out the Problem Solvers Travel Agent. 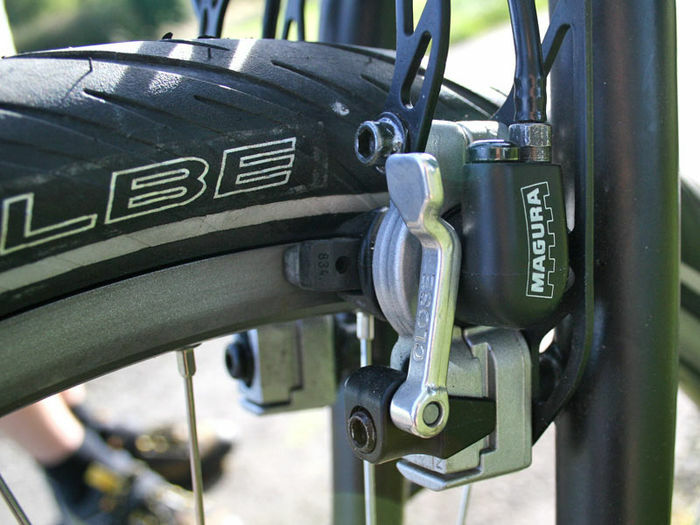 This cable adapter will change the pull-ratio between your road shifters and calipers. 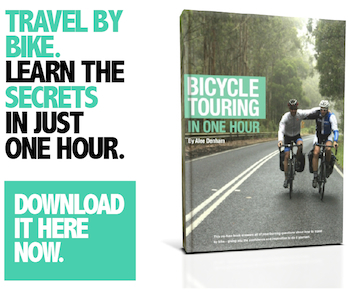 Note: the Travel Agent may interfere with your rear rack; make sure you have space first. 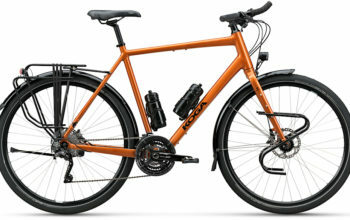 My overall brake recommendation is DISC BRAKES! Disc brakes have truly proven themselves well on my bikes in terms of performance and durability through 30+ countries. They’re unaffected by damaged/untrue rims to boot. My second preference is for v-brakes as they offer great power, reliability, serviceability and cheap parts. Riders heading into remote areas prefer v-brakes due to even the smallest shops carrying spares. Although less powerful, it is easy to understand why a lot of touring manufacturers still offer cantilever brake calipers. 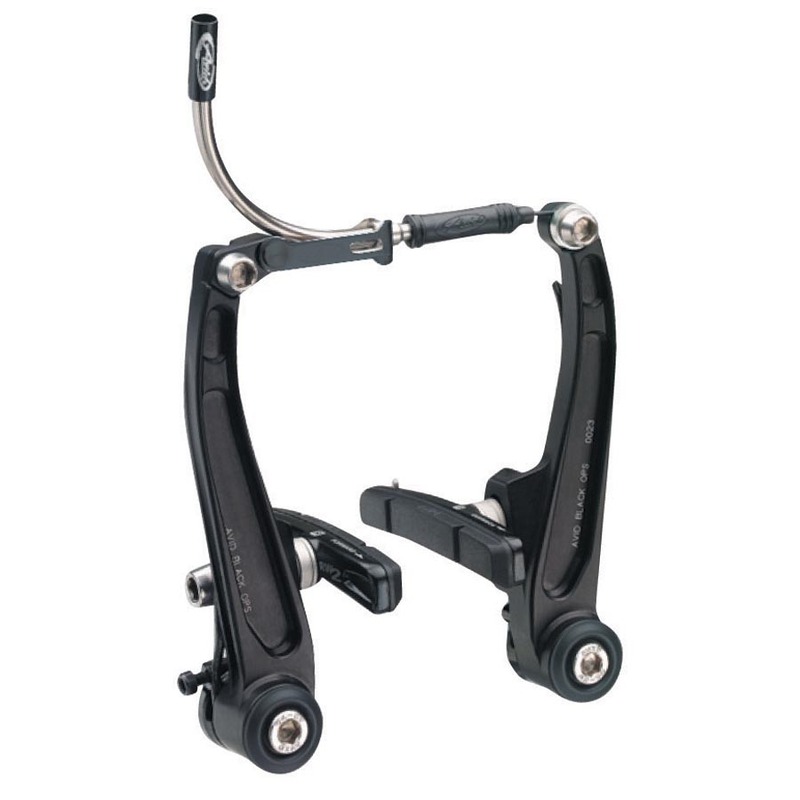 Cantilever brakes offer lots of tyre/rim/pad/fender clearance and are directly compatible with STI shifters. 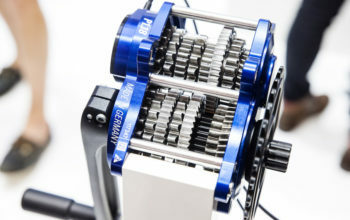 My ideal touring brake setup uses TRP Spyre/Spyke cable disc brakes on a bike with rim brake bosses and machined rim sidewalls. That way I always have exceptional braking power, but if I get stuck with damaged parts or a lack of spares I can temporarily install rim brakes!